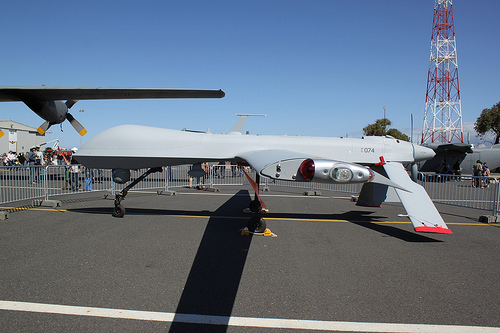 The “Predator” unmanned aerial vehicle (UAV) is just one of many drones available for military and civilian use. This picture was taken in Cape Town, South Africa in 2010. Photo credit: Blyzz (via Flickr, Creative Commons license). “The United States launched another drone strike in Pakistan … in Yemen … and in Somalia.” These are familiar headlines in the post-September 11, 2001 world, especially under the Obama administration. Some analysts even credit these “unmanned aerial vehicle” (UAV) missile attacks with turning the tide in the fight against Al Qaeda. And, if Al Qaeda is fading away, governments’ use of drones is on the rise. Geopolitics will never be the same. A recent Time magazine cover story highlighted the rapid expansion of UAVs in both national security and non-military arenas. The article, by Lev Grossman, is an even-handed assessment of the real and potential benefits and drawbacks of these flying wonders. Civil libertarians and privacy advocates are right to raise serious concerns about the rush to deploy drones in domestic airspaces. In the arena of foreign policy, the geopolitical implications of drones are also worrying. Here are some of the key concerns. Drones dramatically lower the material and political costs of war. As more countries acquire unmanned aerial vehicles, governments will have new capabilities to launch attacks on other states and their own populations. 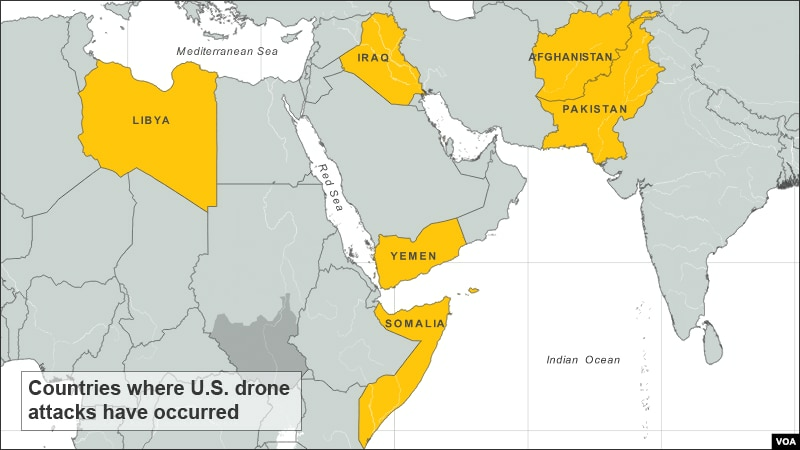 Minor provocations tied to drone strikes could rapidly escalate. Just as the U.S. Central Intelligence Agency (CIA) is now fond of UAVs, other governments will presumably embrace drones for covert operations. Like “cyber-warfare,” the potential growth of lethal covert operations could be very destabilizing in regions like the Middle East, Northeast Asia, and South Asia. Respect for sovereign airspace (and national sovereignty more generally) is likely to decline, particularly with respect to weak and failed states. Admittedly, there are enormous benefits associated with gathering intelligence through a robot drifting or hovering thousands of feet in the air. Even so, critics are right to worry about neo-imperial over-reach. More and more innocent civilians may suffer from these drone strikes. In Pakistan alone, U.S. drone strikes have resulted in the killing of 261 to 891 civilians (i.e. non-terrorists / non-militants) since 2004. 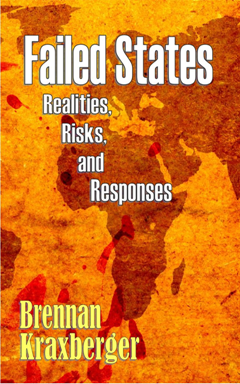 There is huge potential for much more carnage, especially if UAVs proliferate in certain zones of instability, thereby creating uncertainty about which government or group is responsible for the attack. With respect to drone warfare, we are now in a period somewhat analogous to the early nuclear era, before the Nuclear Non-proliferation Treaty (1968). The United States has once again led the way in developing and deploying bold new weapons of war. As drone expert Micah Zenko argues, it is very much an open question as to whether the international community will be able to appropriately use these technologies. When I was in high school, I read the classic book The Rise and Fall of the Great Powers by Paul Kennedy. In the early 1990s, Kennedy and others were focused on the rise of Japan and the presumed geopolitical decline of the United States. These predictions of imminent American decline were of course wrong, or at least premature. Earlier this week, I wrote about the effects of automation on the U.S. and global economies. The key point was that contemporary technological innovations are tending to make many workers redundant. Travel agents, secretaries, legal assistants, factory workers, and many other groups of workers are being replaced by computers and robots. Rising productivity is not leading to net growth in jobs, and many economists are warning that we should get used to a “new normal” of higher unemployment (and lower economic growth rates). For the sake of argument, let’s assume that these trends do persist over the next few decades. Military spending in the U.S. will inevitably decline, as even many influential Republicans recognize. Future American leaders will be much less likely to engage in long-term military campaigns like those in Iraq (2003-2011) and Afghanistan (2001-present). The prospects for Pentagon-led “nation building” missions will decline significantly. NATO’s capabilities will dwindle even more than they already have. Sluggish economic growth and political gridlock in Washington could lead to lack of action on the public debt. In last night’s debate, Mitt Romney aptly used the phrase “on the road to Greece” to refer to America’s fiscal ill health. Though the U.S. has key advantages over Greece, the performance of American political elites over the last 12 years does not bode well for the future. If holders of U.S. public debt demand higher returns and provoke a sovereign debt crisis, the world’s superpower could enter into a period of rapid global retreat, just as Britain did in the 20th century. Anemic, jobless growth could lead to trade protectionism and economic nationalism reminiscent of the pre-World War II period. True, the Great Recession (2007-) was remarkable for its lack of economic nationalism. But if economic conditions do not improve significantly in the next decade, the World Trade Organization and free trade agreements could become big targets, especially for the Democratic Party. Just as Paul Kennedy’s prediction of American decline in the late 1980s was wrong, contemporary pessimists could be very wrong about imminent U.S. decline. Economists, after all, do not excel at long-term prediction, despite the grander claims of some. What are your thoughts about recent economic trends in the United States? Contrary to the title of this post, I am no luddite. Though I selectively adopt new technologies, I recognize the value of such things as MP3 players, ereaders, and smartphones. Even so, a growing chorus of economists and business experts are appraising recent technological changes as a very mixed bag for the (American) economy. On the positive side of the ledger, recent technological innovations are improving our quality of life through ebooks, digital audio recordings, and the wonders of social networking. True, not everyone likes these innovations, but large numbers of people do. Human creativity and communications have benefited enormously from these relatively recent innovations. Corporate profits are at record highs – the private sector is, in fact, doing just fine – and companies are buying plenty of cool new technology. The problem is that they are using it to replace human workers everywhere, with software eliminating white collar administrative jobs and robots getting Chinese factory gigs. The Time magazine columnist goes on to quote the influential MIT scholar Andrew McAfee, co-author of the book Race Against the Machine. For most of the post-World War II period, Americans enjoyed a low unemployment rate (approximately 5-6%) during expansionary economic cycles. Many economists – from across the ideological spectrum – are now arguing that the United States is likely to see historically elevated unemployment for the foreseeable future. Their argument, in large part, rests on the reality of jobs-destroying technological innovation. But, wait, isn’t economic innovation supposed to be good for the economy? Yes and no. This is why Obama’s statement that the “private sector is doing fine,” is both true and not true, depending on how you assess the state of the economy. As Foroohar correctly notes, private firms are reporting excellent profits by historical standards, even as they are creating relatively few jobs. The main purpose of private companies, though, is not to create jobs. If firms can utilize machines to produce goods and services more efficiently and reliably, they will do so in most cases. And given the very high costs of health care in the U.S., they are especially inclined to choose machines. In later posts, I will explore the potential geopolitical and social implications of technology-induced jobless growth in the United States. Though the looming 2012 elections in the U.S. are critically important, these economic mega-trends will outlive the next American administration and the next Congress.